Hi, everyone! Today I bring you news about the latest product from GPA. 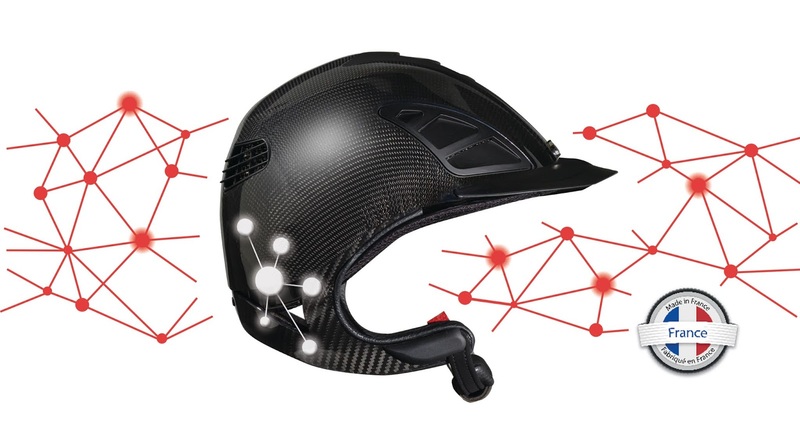 I am talking about the new connected (yes, CONNECTED) helmet they just previewed at Equita’Lyon – how crazy is this?! There aren’t many photos of this helmet yet but I can already tell you some of its features. It looks just like the new GPA helmets I talked about here but it will have a fall detection system and a bone-conducted audio system incorporated. The fall detection system will be useful for riders who usually hack alone. In case of fall, it sends the rider’s coordinates and it will be much easier to find the rider. The audio system seems even more unique to me. The headsets I often see riders using look a bit weird, I know they are super helpful but I would much rather prefer getting the same result without having to carry any extra pieces with me! I’m also loving the fact that the sound is bone conducted, which means the rider will be able to hear everything around him – something that doesn’t happen with the regular systems because earphones block the noise! I’m so curious to see riders use this helmet and once I find someone using it, I might have to ask that person if I can try it!! What's your opinion on this? Tell me below!